CUMBERLAND, B.C. 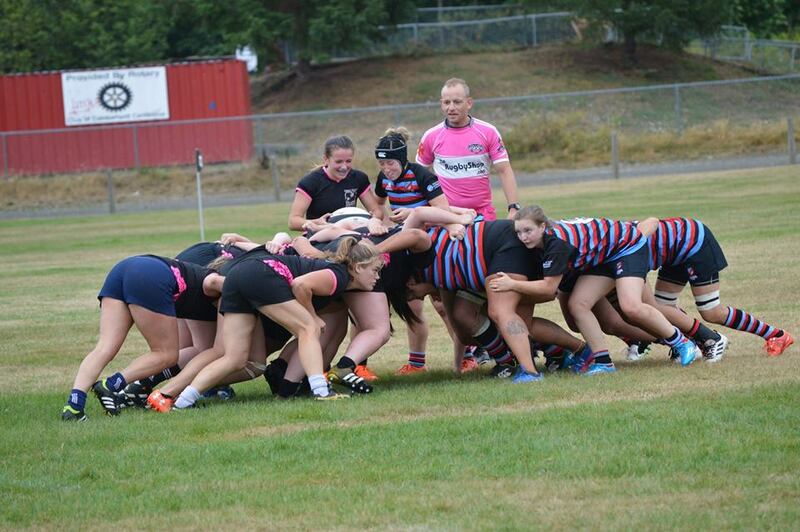 – The Comox Valley Kickers women’s rugby team started the season off with a bang this weekend. On Saturday, the squad hosted Victoria’s Castaway Wanderers at Cumberland Village Park. It was a competitive game with lots of back and forth action. Natalie Nguyen, Paula Simpson, Kristianna Bouwers and Tyra Schaad each scored a try. Karli MacFarlane, Taya Gagnon and Keely Orrick added points on the board. The Kickers came away with the 39-21 victory. “We have new coaches this year, JP Lussier and Thyssen de Goede and lots of new faces on our squad. I wasn’t sure how the first game would go, but all the ladies stepped up and played hard. The practices have been paying off. Our passing was on point and we kept the pressure on the opposing side. I am excited to see how the team continues to improve and grow. This is a great start to the season,” said team captain Natalie Nguyen. Both the senior women’s and senior men’s teams travel to Cowichan next Saturday. The men will play in their first game of the season. Both teams are also recruiting new players. Practices are held on Mondays and Thursdays at Cumberland Village Park from 6:30 p.m. to 8:00 p.m.